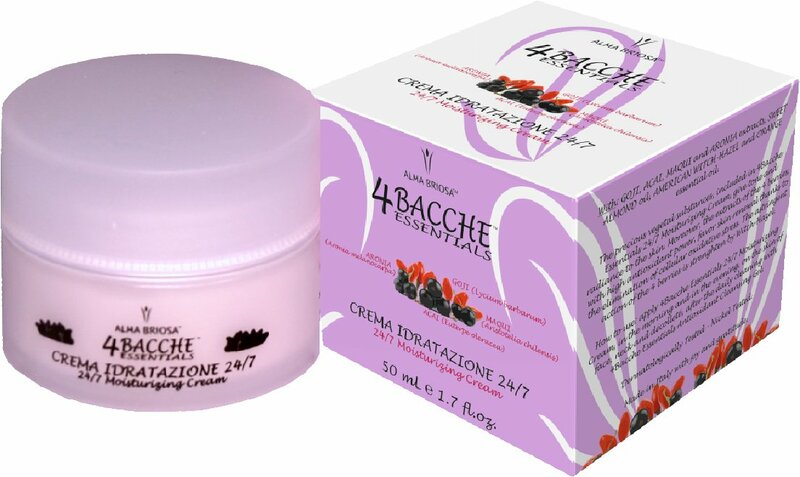 The precious vegetal substances, included in 4Berries Essentials 24/7 Moisturizing Cream, provide the skin with tone and radiance. Moreover, 4Berries extracts contain high antioxidant power, favoring skin renewal as they eliminate cellular oxidative stress. The astringent action of the 4 berries is strenghtened by Witch-Hazel extract. How to use: apply 4Berries Essentials 24/7 Moisturizing Cream in the morning and in the evening, on face, neck and décolleté, after daily cleansing with 4Berries Essentials Antioxidant Cleansing Gel. 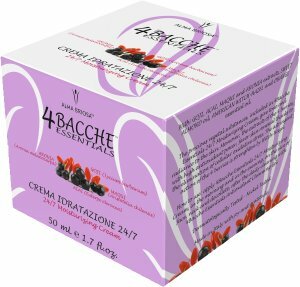 INGREDIENTI/INGREDIENTS: Aqua**, Cetearyl alcohol**, Cetyl alcohol**, Glycerin**, Dicaprylyl carbonate**, Glyceryl stearate**, Caprylic/capric triglyceride**, Prunus amygdalus dulcis oil**, Aristotelia chilensis fruit juice*/**, Hamamelis virginiana leaf water**, Aronia melanocarpa fruit extract**, Euterpe oleracea fruit extract**, Lycium barbarum fruit extract**, Citrus aurantium dulcis oil**, Cetearyl glucoside**, Xanthan gum**, Benzyl alcohol, Potassium sorbate, Limonene**, Citral**.